The funny thing about being human is our flesh and blood packaging. You can’t exactly take us out of the box. We are subject to the quirks, delusions, eccentricities, desires and secret fantasies that make up the undertow of our lives, some of which we are aware of, most of which we are not. We try to fit concepts like ‘creativity’, ‘passion’ and ‘story’ into such neat little boxes: the five-step formulas, the slots in your calendar. But they draw from something much deeper within us: that mysterious, symbolic world known as the unconscious. The preverbal voices of the unconscious were once the voices of your daimon, your genie, your muse. They are not of the everyday world: checkmarks on the daily to-do list. They need to be invoked and received. We can’t create them; we create the conditions that invite and attract them. That requires a routine action of stepping off the beaten path. You need that room of your own, that magic circle, that man cave, or what Joseph Campbell called your bliss station. The din of the world fades away and you drop into the murmurings of your soul. You follow your obsessions and track the truth of your authentic self. You slow down when the world tells you to go faster; you open up when you’ve been taught to hunker down. You accept what wants to come through you without the judgment, self-shaming and fear that sent these parts of yourself so deeply underground in the first place. Yeah.. I gotta go do this right now! Yes! Steady as one goes. I’m trying to do that. Not sure if I’m succeeding. Yet. I noticed that mundane is one of the enemies of creative life. Other is the tendency to “fill” time, to be “busy” – one I struggle with the most, as there always seems to be an infinite number of additional information sources that can enrich me (and there indeed is, more than a hundred lifetimes could accomplish going through, and by that time more will be created). For creativity, for the muse to come, there needs to be some space left for it. Emptiness that we often mistake for boredom or being “unproductive”. I try to leave these “sacred space-time” snippets in my life. But it always is a struggle, often accompanied with an anxiety of missing out. Any advise how to deal with this and to be more strong willing to take “productivity” vacation? 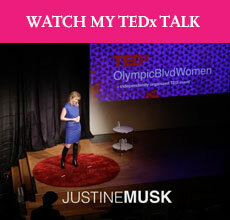 Hello, Justine, Read you article online, really felt deep. Am a Spiritual Psychic, I’ve consulted many clients with relationship problems. I could understand your pain in deep word articles. Really, you feel each and every word from your heart. I read your old blog, as I am going through some things right now, and could you please answer why women are considered “golddigging whores” if they ask for spousal support? I mean, I would think any sensible person would ask for spousal support, whether they need the money or not. Also, is it me or is the obsession with golddiggers rooted in misogyny? Anyway, I wanted to say that I think you were very strong for blogging about your divorce and defending your stance. I know I couldn’t take those nasty comments people were and still are directing at you. I agree with you in the general concept, but I may say “challenge” instead of “enemy”. This is a must for creativity to become “creativity”, or else, it would be nothing more than an every day event. Women, in particular, often allow themselves to be hijacked by their loved ones’ expectations. There is a reason for this. Being loved (to belong) is one of four emotional needs (not nicities but essential to wellbeing). Unfortunately our loved ones, parents included, sometimes expect of us nothing less than to forget trying to discover or following our passions. We become domesticated but unhappy “good little girls” if we succumb to such expectations. So we belong at the expense of getting to know and love ourselves, the only entity that can make our creativity blossom. And that’s a sellout of but a quarter of our emotional needs. What about fun (learning), feeling empowered and understanding the true meaning of freedom? One needs to know and act as one’s real self to even hope to realise the positive aspects of the latter 3 emotional needs. One also needs a balance in these 4 emotional needs to survive and thrive. It is hard to achieve if we cling to hard to the need to be loved and accepted (cf. William Glasser). The above conundrum probably explains why the enemy of creativity is the culture of daily life. We are wired to need love, learning, empowermet and freedom. When one of more of these needs are sorely missing or witheld from us (usually unconditional love and acceptance) by the “culture of daily life” we accept (reluctantly, I hope) to compensate by grabbing those needs we can attain, and these may often be the evil / destructive side of the other needs, such as depressing, power-monguering, and/or restricting the freedom of others. @Down If a woman marries and puts her capacity to financially support herself on hold (be it for kids or any other reason), then she becomes divorced, it is not gold-digging – it is compensation. Any man who doesn’t like that should never marry. It’s really that simple.